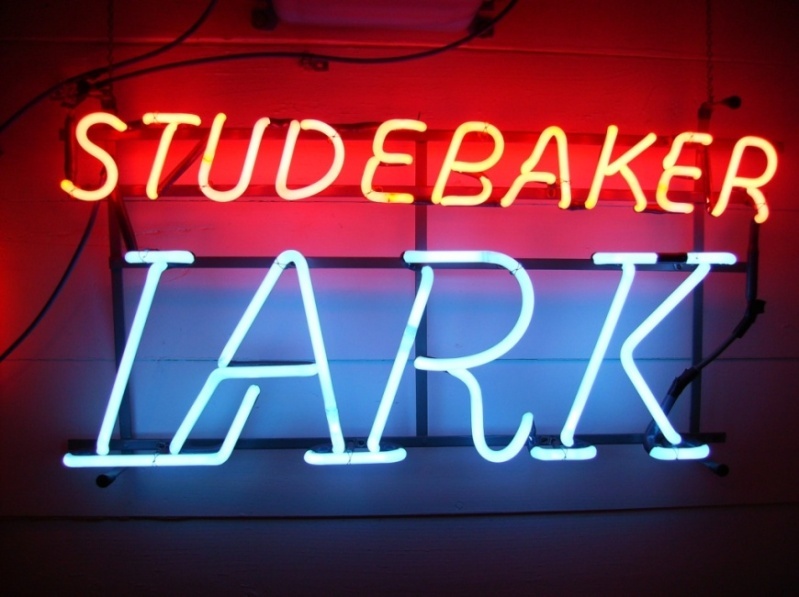 1958 Studebaker Hawks Ad, a photo by aldenjewell on Flickr. Some eye candy for a rainy Monday, courtesy of Flickr automotive uber-poster Aldenjewell. This is really a rare piece, as times for Studebaker were tough - 1958 was such a lean year, that almost all print ads were black-and-white instead of 4-color. They didn't even print a full brochure that year - just color one-sheets for each model. So here's one of the very few full-color S-P ads for 1958 - enjoy! If you own an old car, it's virtually guaranteed that you will spend time, effort and money trying to track down some problem that should be easy to fix, but which somehow eludes you in the same way in which common sense eludes politicians. This is the story of one such quest - now solved! Almost since the first day I've owned Barney, there's been the smell of gasoline in the passenger compartment. I don't mean a little whiff - I mean "Hello sir, can I fill 'er up? "-level odor. It was bad enough to require driving with the windows open and vent wings, too, in order to keep the air clear. In chasing this problem, I'd been systematic - replacing the two soft sections of fuel line between the tank and carb, replacing every gasket, hose and tube between the filler neck and the tank inlet (see this post for details), and checking the seal for the fuel gauge sending level for leaks. Nothing worked... it smelled as strong as ever. Finally, I got a break. I was browsing through Barney's Chassis Parts Manual last weekend (yeah, I read parts manuals for relaxation... ya wanna make something of it? ), and noticed something I'd never seen before in the parts diagram for the '62-'63 fuel tank: a UFO (Unidentified Fixable Object). Look at the diagram above. See the long, bendy tube coming off the filler neck and running to the left? That's the fuel tank vent tube. 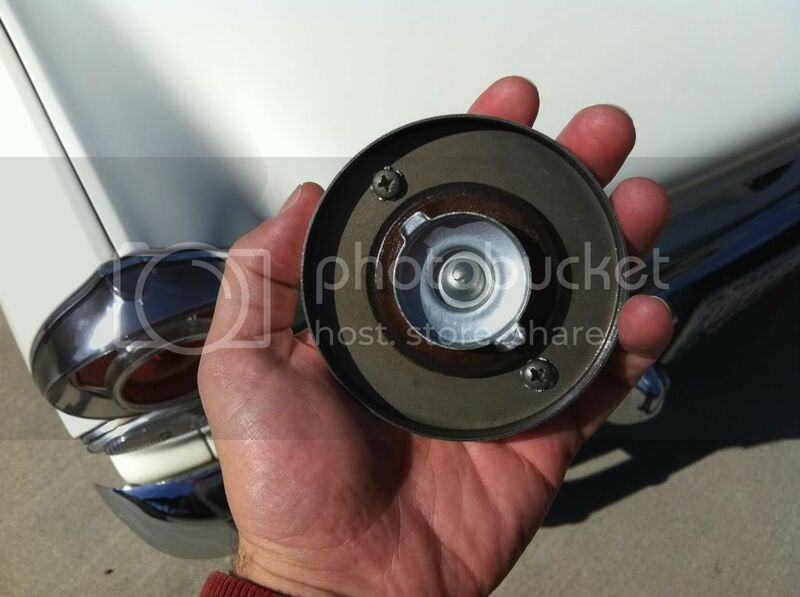 Studebaker used an non-venting gas cap on later Larks, so this tube was used as a fuel tank vent. It clips to the rear valence panel inside the trunk, wraps around the left taillight assembly, and finally exits through the trunk floor. Well, see the itty bitty part circled in red on the diagram? That's a grommet. It's purpose is to go on the end of the vent tube and seal its exit through the floor pan. I had never, ever seen this part callout before! And of course, the original one was long gone, so there was no visual evidence that anything was supposed to be there when I inspected the trunk. So I went down to my local Ace hardware and got an appropriate-sized grommet from the bins (1/4" I.D., 3/8" O.D. ), slid it over the end of the vent tube and pressed it into place in the floor. Woo hoo! That did the job. After a week, I went out and opened up the car at noon - typically when the smell was strongest, after having sat for a while in the sun. No smell! I drove the car around for about 2 hours that afternoon, just to make sure, and the problem is gone. While I was at it, I fixed one more fuel-related problem. A few weeks back, I moved the car onto the street and parked it nose-up (I live on a pretty steep hill). 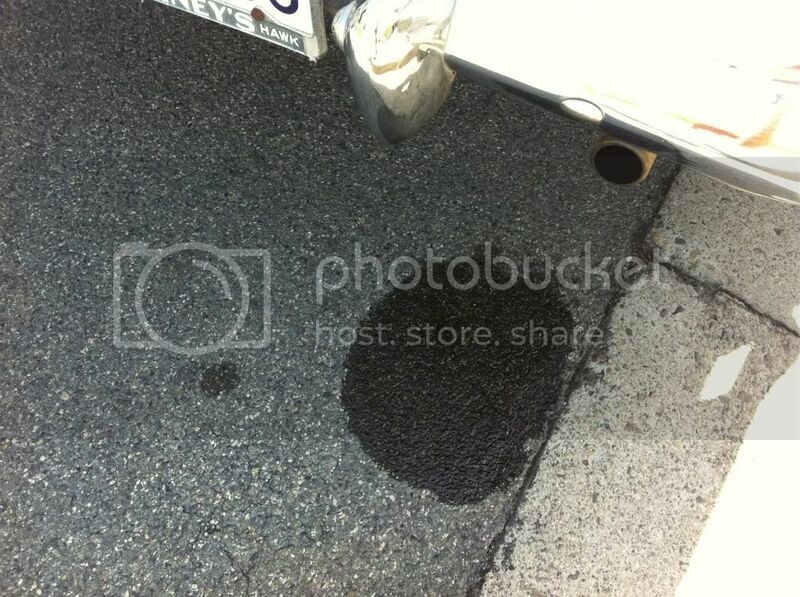 When I came back, a wet spot under the back bumper and a slow, steady drip told the tale: the fuel cap seal was about as loose as a sailor on Friday night. 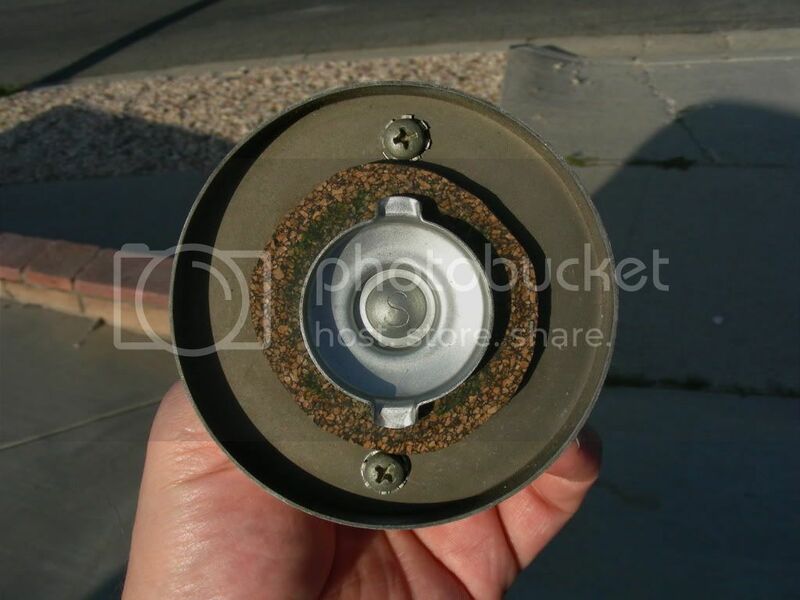 The factory fuel cap uses a partial-face seal. In the photo at right, you can see it just around the center stamping - that dark brown circle. This is a fiber gasket attached to a steel backing ring; it's only as big as the end of the fuel filler itself and seals to the rolled edge of the filler pipe. I guess that after 49 years, this seal has gotten a bit softer than it was, originally. The fix for this is actually pretty easy: just add more gasket material. I went down to my neighborhood NAPA and got a roll of 3/32 Fel-Pro cork gasket material. I used aluminum foil to trace the size the gasket needed to be, then cut a circle out of the cork and slipped it around the center of the cap. Now the cap fits nice and snug, and there's no way any gas is getting past that seal. It ought to help with my fuel economy, too, since the gas formerly used to lubricate the asphalt will now be going into the carb! It's been crunch time at work, and I've been writing so much that the last thing I want to do when I'm done for the day is write some more... so the blog has been suffering. I'm sorry about that, and thanks to all of you who have written asking if everything was OK. It is! Just very, very busy. I'm going to walk through something that seems pretty simple, but is actually an operation most folks have no idea how to do: replace a windshield wiper arm. I'm not talking about the blade - I mean the actual chrome/stainless arm that moves back and forth across the glass. The passenger's side wiper on Barney has been worthless since day one; it simply didn't have enough spring pressure left to hold the arm tight against the glass and force the rubber to wipe. So the edges of the wiper would contact, and the middle would stay unwiped. Someone had obviously monkeyed with the wiper before. 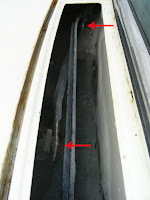 On Trico wiper arms, which Studebaker used for Larks, there was a little stainless-steel cover that protects the spring. On this arm, that cover was sprung and the spring had been replaced, to no avail. You can buy Avanti wiper arms all day long - they've been reproduced. Not so much for Larks. One of the Avanti arms works on the Larks; it's the driver's side arm ;) There are "universal fit" arms available, but these are mickey-mouse contraptions with adjustable joints and such to try and get the blade angle right... no thanks. I finally found a dude parting out a '63 Cruiser on eBay and scored a pair of arms for $20, so yay! I could finally replace the old passenger-side arm with one that worked. The new arms arrived and they were sweet, so today was the day. Here's the part that gets tricky: removing the old arms. No one really knows how to do this! It's one of those things you really never have to do... until you have to do it. The arms press-fit onto a splined hub that's driven by the wiper motor and transmission, but it's not the press-fit that holds them on: it's a small spring clip built into the arm itself, which engages the bottom of the driven hub and keeps the arm from flying off when it's being used. 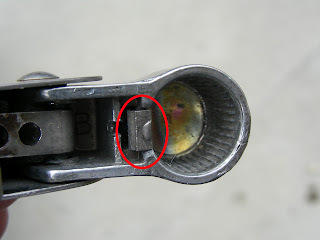 This photo shows the clip. 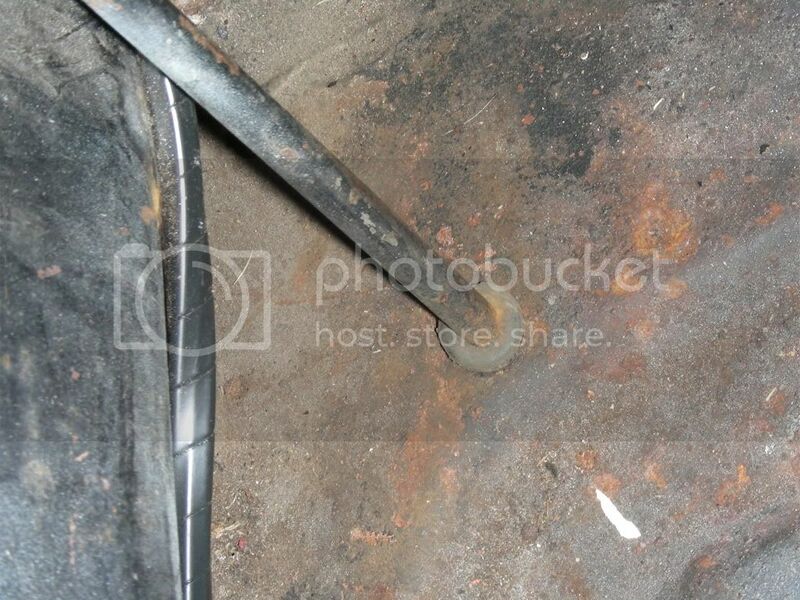 So the question is: how do you get under there to disengage that clip? Ah, well, like everything else, there's a tool for that. Lisle #65750 is a windshield wiper removal tool. If you look at it, you can see that there's a tab with a little tang on the end; you insert this tang under the end of the spring clip on the wiper arm and pull while you (or a helper) leverage the arm off of the hub. Problem is: nobody, and I mean nobody, carries these tools. They're not expensive, but if you want one, you're going to have to get it from JC Whitney or some other mail-order house. And, if that's what you want to do, you can stop reading right here, because we are not going to use this tool to remove the wiper arm. Instead, we're going to use this tool, and a small pry bar. It's yer standard Craftsman right-angle awl, and it will do the job just fine with a bit of finesse. First, protect your paint. Put a couple of rags or pieces of cardboard on either side of the wiper hub, and make sure that you're not pressing on the paint as you use the tools. Also make a mental note of approximately where the end of the wiper arm is laying against the windshield, so that you get the new arm on in the correct position. Oh, and you'll need to remove the wiper blade from the arm before you begin. On these older-style arms, it's really simple: just find the little spring clip underneath the junction of the arm and blade. Pull it down, away from the arm, and slide the blade off. This is actually easier with a helper, but you can do it yourself - I did! Lift the arm and locate the spring clip. Slip the point of the awl behind the clip and pull away from the wiper hub. While keeping that outward pressure, use the small pry bar to lift the opposite side of the wiper arm at the hub, as the photo shows. Don't use a whole lot of pressure - you don't need to. If you've released the clip, a small amount of upward pressure on the opposite side will slide the arm easily off of the hub. Remember when I said someone had monkeyed with this arm before? Here's the proof. The splined hubs are pot metal, and someone had boogered this one, probably by being ham-handed with a tool to get the arm clip to release. They must have really wailed on it to have taken a chunk this large out; luckily, there's still enough area there for the clip to engage and hold the arm onto the hub. If this hub had been damaged more, I'd have had to hunt down a new pivot assembly - the hubs are not separable from their shafts. So now, it's just a matter of sliding the new arm onto the hub. Do a test-fit - position the arm to match the position of the old arm (you made a mental note, right?) and slide it on partway to check its angle. If it's not right, pull the arm back off and reposition - you might need the assistance of the pry bar again. If it's good, push the arm all the way on and give it a sharp smack with the heel of your hand - you'll hear and feel the spring clip engage. Woot! All done, right? Not so fast, Ace. As long as we're working on wipers, there's one more thing that's usually overlooked: lubricating the wiper transmission. There are a series of connecting rods hidden inside the firewall vent cavity that convert the rotary motion of the wiper motor to the reciprocating motion of the wipers, and there are three connecting points that need to be oiled up. If you've ever driven an old car whose wipers squeaked when you turned them on, it generally because no one has lubricated them in a very long time - if ever! On my Lark, you access the wiper transmission through the cowl fresh-air vent. Open the hood and you'll find four Philips-head screws that hold the vent grille to the cowl. remove them and the grille slides right off. With the grille off, you'll have easy access to the transmission rods. 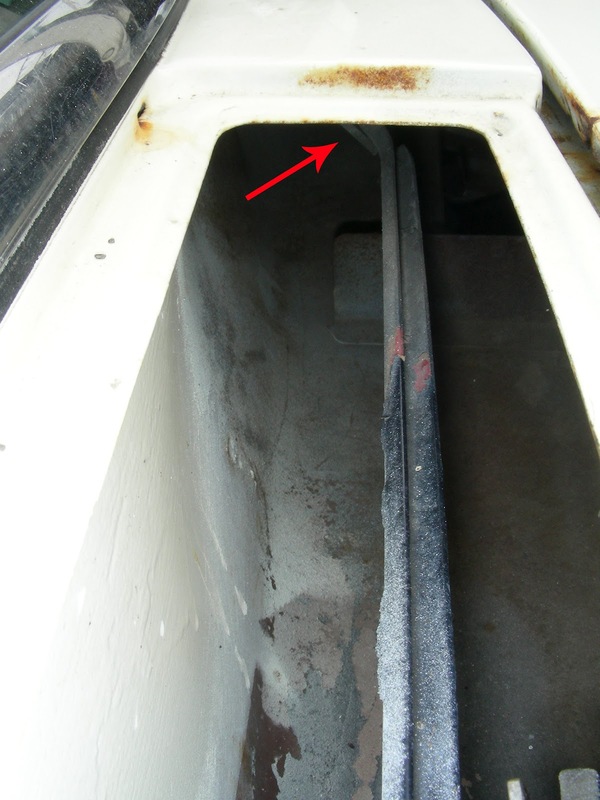 The photo on the left is looking into the cavity from the driver's side of the car; you can easily find two of the three lubrication points. The photo on the left is a view from the passenger's side of the car, and shows the third, hard-to-get-to point, which is hidden under the driver's side of the cowl. You will need a telescopic oiler to reach this point. It might help to run the wipers a bit and shut off the key in the middle of the cycle, which will position the lubrication points more near the opening in the cowl. Drench 'em with your favorite lube - I keep a little bottle of Marvel lubricating oil around for this, but you can use engine oil too if you like. Put the grille back on and you're good to go! I haven't had much free time to write. It's winter - hard to work on cars in your driveway during unpredictable weather. Barney's been running well, and I'm just driving him (hey, there's a concept). I've taken over as Administrator of the Studebaker Drivers Club Forum.